Welcome to the webpage of our Faculty. I would kindly ask you to read these words carefully, together with other facts about the Faculty of Geoeconomics (GEF), where you can successfully study, acquire many skills and cutting-edge knowledge about the rapidly changing world that we live in. The Faculty of Geoeconomics from Megatrend University is a relatively young educational-scientific higher education institution, which has become recognizable in the system of educational of the Republic of Serbia since 1999, but also in wider national, regional and international framework. Our faculty is fully accredited – this information can be verified both on our website, and the website of the Ministry of Education, Science and Technological Development of the Republic of Serbia. I would like to underline that the educational programs of this faculty are original and multidisciplinary in nature and that, accordingly, our students acquire high quality and applicable education, gaining a diploma of an economist who is capable of engaging in contemporary and dynamic international economic, political and cultural relationships effectively. In practice, on the one hand, this means that the regions are seen in a broader context of their international economic and political relations, and that the position and socio-economic development of individual national economies is studied within a particular region. Starting from the above methodological concepts and approaches, the structure of the overall GEF study program is defined at all three levels of education. Recognizing the fact that competition among higher education institutions that produce economists in the Republic of Serbia is constantly increasing, the long-term strategy of our faculty relies on the improvement of the curriculum, introduction of content and methodological innovation, ensuring adequate quality control of the teaching process, teachers and all other associates in charge of the realization of our curricular and extra-curricular activities. In addition, GEF has achieved a high degree of internationalization both of its programs, its teaching staff and it scientific-research activities. In this context, I would like to underline that the international affirmation of GEF is a proof of our quality pedagogical and scientific research work. The Faculty has established cooperation in the region, the European Union, Russia, China, Latin America and Asia. As the only Serbian educational and scientific research institution specialized in the field of regional and geoeconomic studies, GEF is internationally recognized and accepted. This means that our students participate in the exchange programs in many countries and the work of international student workshops, and they volunteer at scientific conferences of European and world importance (European Council for Social Research of Latin America – CEISAL, XVIII Congress of the International Federation for the Study of Latin America and Caribbean – FIEALC, Round Table “Serbia on the Road to the EU”, etc.). The above mentioned strategy pays special attention to our students, with whom excellent cooperation has been established so far, and whose activity and presence remain extremely important in all domains of faculty work. Finally, I would like to emphasize that our present, but also our future students have on their disposal excellent conditions for studying, good communication with professors and teaching assistants, and efficient students’ and other services of the faculty and university. 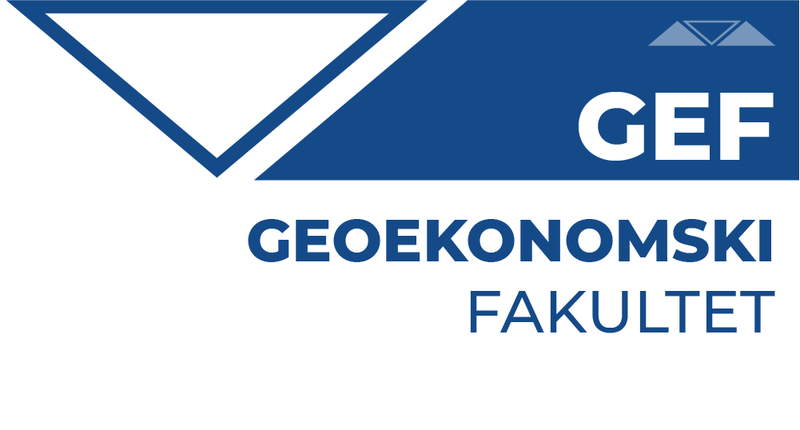 Why study at Faculty of Geoeconomics? The GEF study program provides theoretical, contextual and practical knowledge in the area of the economy of the regions. The uniqueness of the program is reflected in the macroeconomic and multidisciplinary approach to the study of the region. In addition to economics as the basic scientific discipline, this concept of studying introduces students to the study of the geographical, historical, cultural and linguistic characteristics of a region, including its international position. Furthermore, it is important to note that the regional level of analysis is complemented both by global and national themes and specifics. (performed as a joint program with the Faculty of Business Studies).